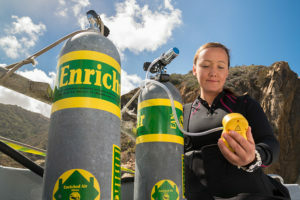 If you own a modern dive computer, odds are it is capable of tracking your exposure to both air and Nitrox. Finally isn’t it time you started taking advantage of your computer’s capabilities? Cancellations or rescheduling require 48-hour notice. You may reschedule one time at no charge, after that any further adjustments will incur a $25 rescheduling fee per change. Cancellations are subject to a $75 cancellation fee. This Enriched Air (Nitrox) runs approximately 1 hour and is held at our shops on your chosen classroom date. Studies must be completed by class time.